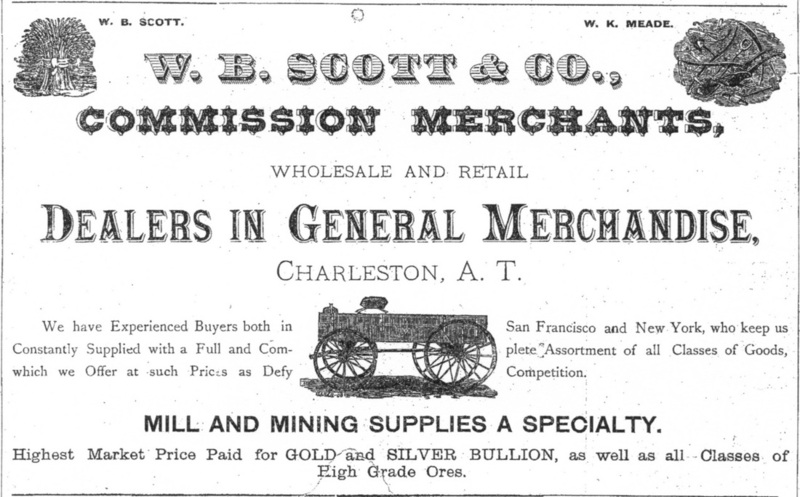 Charleston Merchant W.B. Scott purchased the primitive store started at Millville by J.B. Allen, later moving it to Charleston so that he could take advantage of the local thirst for alcohol, which only fueled the boomtown’s penchant for indiscriminate lawlessness. He would later aid Mining and Milling magnate Richard Gird in a tense negotiation with area ranchers. Charleston’s boom was on display for all to see. The Arizona Citizen reported that “…sixteen mule teams haul away from forty to fifty thousand pounds of ore daily…” But with that sudden wealth came a myriad of competing interests, values, and objectives, both personal professional. J.B. Allen, for whom Allen Street in Tombstone would be named, told of start issues that Gird and his enterprises encountered. 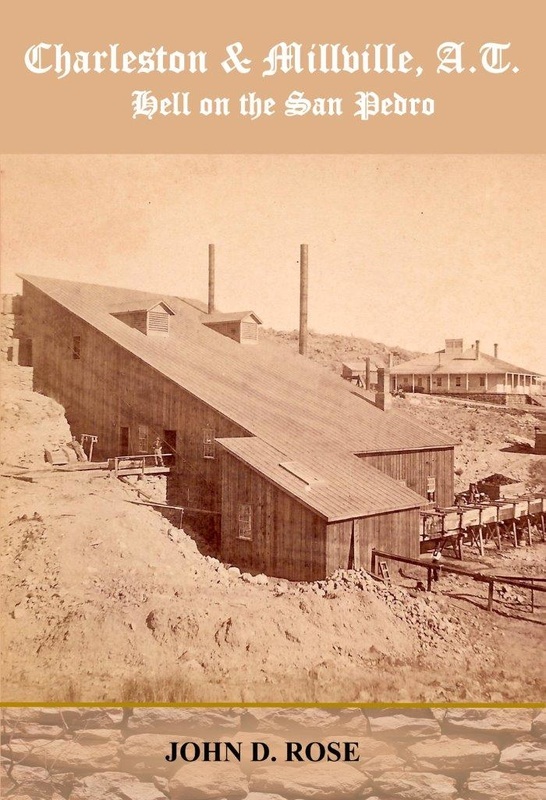 “They had their ditch pretty near built, and the mill pretty near up, and there were ranchers who threatened to get an injunction that they should not take the water from the stream…There was a contract made with the Mormons to put in the dam, and the material was to be furnished by a stated day, and they did not get the saw mill running…Then there was contracts made with large teams for hauling lumber from the sawmill to the mill site, and to the dam, and the teams came and there was no lumber for them to haul…” Such difficulties were ironed out as the project moved forward. But a problem of a different nature would arise over liquor. One of Gird’s key investors, John Vosburg, advocated for the corporate prohibition of liquor, and was dead against any drinking. To the average worker at Millville, that may have been bad enough, but when he tried to forbid workers from leaving the company property and crossing the river to drink in Charleston, that was a bridge too far. “I recollect there was some good deal of dissatisfaction with Mr. Vosburg. He was Superintendent of the laboring men on the ditch, and the outside work at Charleston in connection with constructing the mill, and he had some ideas of propriety which the men did not approve of. He did not want no liquor brought on to the millsite, wouldn’t allow it, and he objected to the men going across the river and getting it. Such stipulations are normal on property owned by mining companies in general, and Gird stood fast to the stipulation that he “should not sell any liquor on the ground.” Perhaps Scott, considering the higher investment of a permanent structure, desired the guarantee to remain in one place and sell whatever goods he saw fit to compete in the marketplace. “I built a house [place of business] on the other side of the river at Charleston.” The sale of liquor would continue to be concentrated at Charleston, rather than Millville, due to this understandable policy, which would only add excitement to the booming village. At Girds’ behest, Thomas Bidwell approached Scott and “stated that such an arbitration was to be had and asked me if I would serve as one of the arbitrators. I objected, stating as a reason that I was in the mercantile business there and doing all I could to retain the good will of the public at large, and that if I went on that arbitration, I would very likely offend the mill company or the ranchers, and I did not care to do either, and after some argument on his part that I should feel it my duty to settle such things, he left without my consenting to become an arbitrator.” Learning that Bidwell’s attempt to engage Scott had failed, Gird decided to handle it with personal diplomacy. Scott had played offered bridge between the local ranching community and the corporate interests of Richard Gird and his partners. And he was also in Charleston early enough to enjoy its fleeting riches before the town went bust. The above information is in part excerpted from Charleston & Millville A.T. Hell on the San Pedro, by John D. Rose. This is the first and only book ever published on Charleston, released in 2012. For more on this remarkable story and other research breakthroughs, this book is available at https://www.createspace.com/3758160. It can also be purchased on Amazon.com.